Light, smoothing moisturiser for normal and combination skin that counteracts fine lines, dryness and dull skin. This deep-nourishing skin care helps prevent the premature appearance of ageing and leaves the skin feeling soft and supple with a healthy natural glow. A lighter alternative to Wild Rose Smoothing Day Cream and excellent under make up. Suitable for vegetarian. 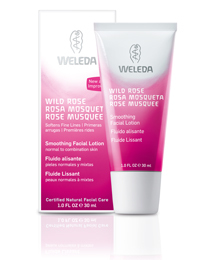 For dry skin conditions caused by hormonal changes or environmental stresses, Weleda Wild Rose Smoothing Facial Lotion can be used in combination with Weleda Wild Rose Smoothing Day Cream and/or Weleda Wild Rose Smoothing Night Cream. In this case allow the facial lotion to absorb into the skin for a short while before applying the other cream over the top. After cleansing apply sparingly and evenly over the face and neck, gently massaging in. Apply only as much as the skin can readily absorb. Wild Rose Hydrating Facial Lotion is also ideal as a base for make-up. INCI: Water (Aqua), Alcohol, Simmondsia Chinensis (Jojoba) Seed Oil, Prunus Persica (Peach) Kernel Oil, Glycerin, Rosa Moschata Seed Oil, Glyceryl Oleate, Copernicia Cerifera (Carnauba) Wax, Beeswax (Cera Flava), Magnesium Aluminum Silicate, Fragrance (Parfum)*, Sedum Purpureum Extract, Rosa Damascena Flower Wax, Equisetum Arvense Extract, Commiphora Myrrha Extract, Xanthan Gum, Chondrus Crispus (Carrageenan), Glyceryl Stearate SE, Sodium Beeswax, Limonene*, Linalool*, Citronellol*, Benzyl Alcohol*, Geraniol*, Citral*, Eugenol*, Farnesol*. *from natural essential oils.